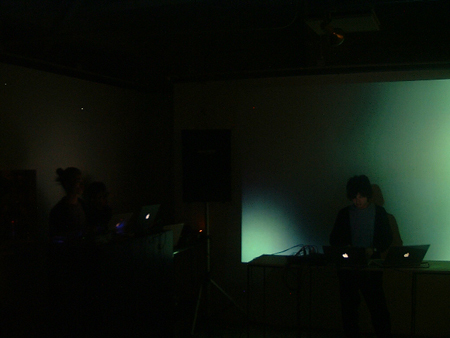 The first live showcase in Sapporo for “Progressive Form“, which became the Japanese representative independent record label for supporting various new electronic sounds and scenes since 2000, was held at Soso Cafe. This event entitled “Progressive Form Showcase” focused on the live performance of the artists who represent Progressive Form, Takamasa Aoki and Ryoichi Kurokawa from 19:00 to 22:00. The event was started off by DJ Nik, the representative of Progressive Form. The selection seemed to be backed by the confidence which has led the label so far from establishment. It was experimental and an acute song selection, while putting emphasis on the listening element, expectation grew for the main event. 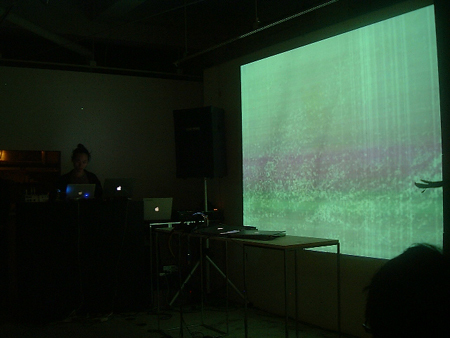 As an image was projected on the screen at the front of the hall, Ryoichi Kurokawa’s live started in a somewhat dignified atmosphere. The beautifully distorted visual using water, sky, and a building as elements and the music which extended the world made my head empty. As time passes from it, to an instant my memory of the last direction is ambiguous. When consciousness returned, I noticed that the sound was finished…dying down. It was almost a perfect performance so I was drawn and lost track of time. There was a break for about 20 minutes in order to return the ear and head to a flat state after his live. Aoki Takamasa is known as the central existence of the new electronic sound of Japan in the past several years thorough many live performances overseas. He had 9 performances in 6 cities in Europe including “Sonar 2003” and also had 3 performances in different cities in Europe in August this year. This live performance is immediately after his homecoming. The live of Aoki Takamasa started. Although the live style which uses two laptops had become the norm at clubs. It feltlike a clearly different sense of incongruity from the spectacle as music progressed. The hall made the peculiar sound space as if electronic sound had a life in space and it changed the space’s atmosphere dramatically. It was a wonderful experience which made us consider anew what real quality is. The statement that the essence of the electronic sound and the visual in future are here will not be an overstatement. Anyway, try listening to their CD “making volume into the maximum”. Aoki Takamasa: Born in 1976 in Osaka. A new generation creator and composer who utilizes computer software. After graduating from university, as nexus 6,5 he started his musical production. By using cutting edge technology and software, his original and experimental production approach, simultaneously locks a groove and is very delicate and simple. Aoki Takamasa’s production attractiveness is that it fills the gap between computer/electronic club music and contemporary music which is both innovative and unique and this style “sounds like the computer itself is alive and human, hitting the drum”.BR> He releases his new album called “Indigo Rose” which included the title track, collaborated with Japanese female Mego’s artist Tujiko Noriko, in December 2002. In January 2004, he will release his 4th album “Quantum” from Yoshihiro Hanno’s label “Cirque”. 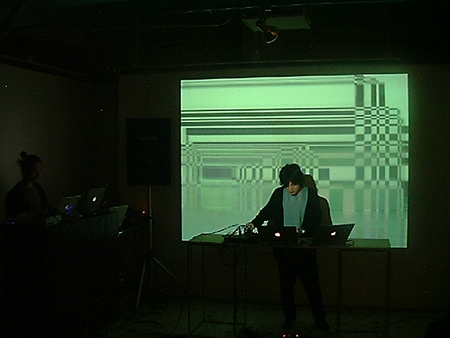 Ryoichi Kurokawa: Born in 1978. Lives in Osaka. Regarded as the new breed of visual and electronic sound artist whose future is highly anticipated. From 1999, he started his visual production. In 2000, he went to France and started regularly working and presenting his visual productions with video installations and video work in various individual and group exhibitions at domestic and overseas art and film festivals. 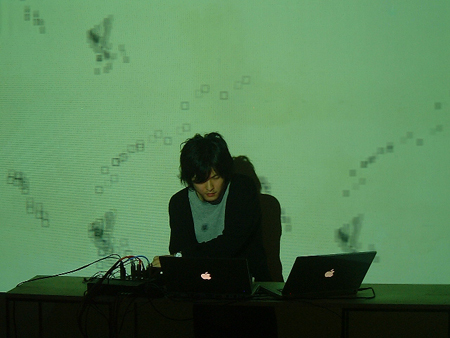 In December 2002, he produced the artwork for Aoki Takamasa’s album, “Indigo Rose”. And in May 2003, his debut solo album on CD and DVD was simultaneously released. In June 2003, he went to Sonar Festival to perform with Sketch Show (Ex-YMO, Haruomi Hosono and Yukihiro Takahashi’s new unit) as their visual producer.